Join the World Trade Center Kentucky (WTC-KY) and other trade practitioners that are seeking a hands-on, boots-on-the-ground visit to a select U.S. ocean port. 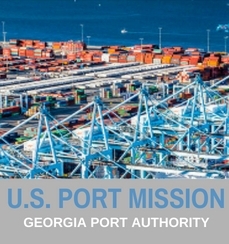 During this unique trip, meet with professionals in the industry who will provide insight into the inner workings of a major U.S. port. Participants will learn best practices for managing ocean cargo through intermediaries and establishing a distribution network. As an added bonus, the WTC-KY will provide a customized trade statistics report covering your company’s product(s). Do you know how your cargo moves in and out of a US port? Do you want to make sure your ocean containers move smoothly? Do you understand the mechanics of ocean freight movement? Want to network with companies who are leaders in supply chain optimization? The DeSoto-Hilton | 15 East Libery St.